Both in style and subject-matter this work represents a radical departure for Cezanne and reflects the influence of Camille Pissarro, with whom he was then working. His preceding paintings were mostly executed in dark, earthy colours and had imaginary subjects, such as The Abduction, 1867. In the spring of 1872 he moved with his family to Pontoise, where Pissarro was already settled. Late in 1872 he moved to nearby Auvers, where the collector and patron Dr Paul Gachet lived, and he stayed there until 1874. Working alongside, Pissarro in both Pontoise and Auvers, Cezanne learn to paint directly from nature, adopting the palette and execution of his older mentor. He used much lighter tones and built up the work with separate strokes rather than in a thick, broad impasto. Even the composition of this work owes something to Pissarro, with the road aominating the foreground. 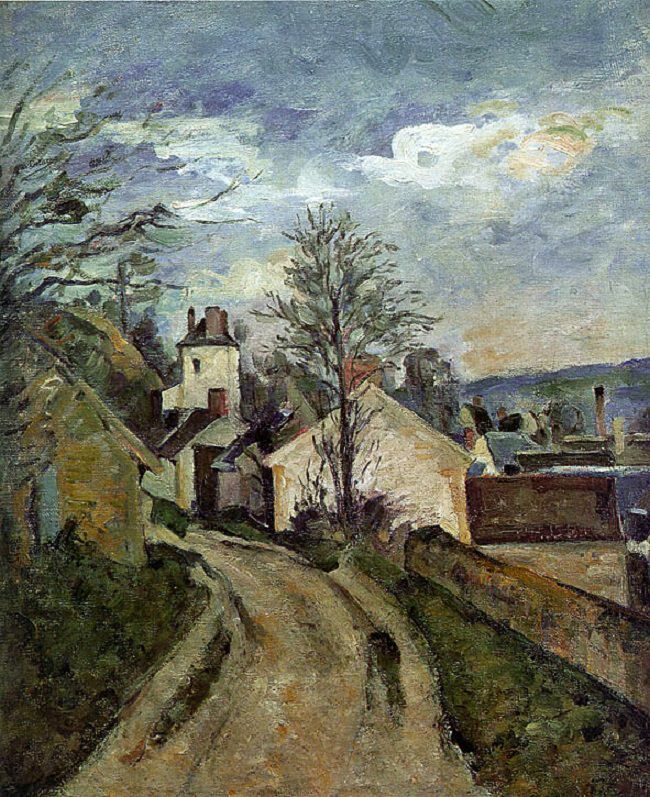 Pissarro had great faith in his young colleague, and commented, 'If, as I hope, he stays some time at Auvers, he will astonish a lot of critics who were in too great haste to condemn him'. Cezanne took part in the First Impressionist Exhibition of 1874 and the Third of 1877. At both his paintings received the most contemptuous reviews of any of the participants. At the First Exhibition one critic said 'Of all known juries, none ever imagined, even in a dream, the possibility of accepting a work by this painter'. Even some of the other Impressionists, such as Degas, felt uncomfortable about having his work in the shows because of the ridicule it attracted. Not until the 1890s was his painting seriously considered and for years he made repeated but hopeless attempts to get his work accepted at the Salon. Though influenced by Pissarro's Impressionist style at the time of this work, his painting never achieved the lightness of touch favoured by other Impressionists and his concern for structure remained evident. It was precisely this latter quality, achieved particularly through planar composition and short, parallel brushstrokes, that prompted the development of Cubism by Pablo Picasso in the early twentieth century and thus the complete overthrow of the Impressionist aesthetic.